Jalfrezi (also jhal frezi, zalfrezi, and many alternative spellings) is a type of Indian curry in which marinated pieces of meat or vegetables are fried in oil and spices to produce a dry, thick sauce. It is cooked with green chillies, with the result that a jalfrezi can range in heat from a medium dish to a very hot one. Other main ingredients include peppers, onion and tomato. 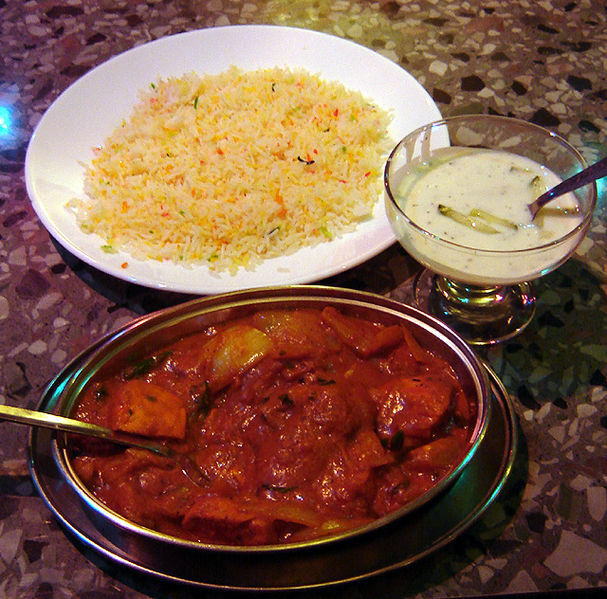 Left: Chicken Tikka Jalfrezi, pilau rice, and cucumber raita. The jalfrezi dates from the times of the Mughals, when it was created as a way of using leftover meat; the chillies helped to disguise any disagreeable taste. The name comes indirectly from Bengali jhāl, spicy food, and Urdu parhezī, suitable for a diet.